After my detailed research into various two-dimensional art styles showcased in Week 1: The Start of Semester II and Week 1: From Comics to Animated Films, I concluded that the most appropriate visuals for As It Lies would be in the style of modern comic books. As this is an illustration style I have not worked in, I needed to spend the week honing my skills and learning how to do it properly. Basically, I was about the spend some time reading about and analyzing comic book art. This was very much a necessary step before starting to do any actual assets, because I needed to create a consistent visual language, an art bible if you will. Furthermore, I needed to determine the specific brushes and other technical specifications I would be working with. Once I had those building blocks of the style, I would then be able to create all of my characters and animations with a unified methodology. The first step in this exploration was to conduct a study of the appropriate brush to use when creating my digital illustrations. The outlines are a crucial element of the comic book art style, which is why it was so essential to get those right. The smoothness, thickness, and shape of the outlines can be used to achieve very different stylistic effects in comic books. I was going for rather standard outlines, which would not be too essential to the scene and too distracting to any of the gameplay. The outlines cannot take the player’s attention away from the puzzles, but rather must accentuate the ongoing actions and communicate those clearly. I started the process of selecting the best brush for As It Lies by choosing an appropriate reference photo to guide me. As I am striving to imitate a modern comic book style that would not be too intrusive with the gameplay, I decided to base my work on panels from Ashe: Warmother. 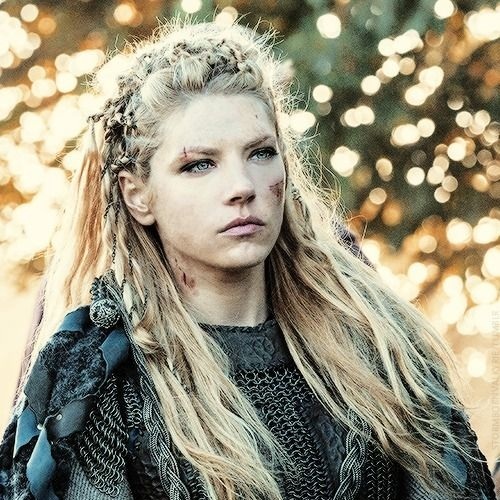 Ashe: Warmother is published by Marvel Comics and its first issue was released in December 2018, which is why I thought it would be a fine example of some of the most recent trends in the medium. Additionally, that comic also focuses primarily on its story and action, which is why the line work is not very intrusive, making it an ideal reference for my purposes. Once I had picked my reference images, I opened Procreate to attempt to recreate that style of line work. I conducted a series of experiments with different Inking Brushes, with different thicknesses, but with 100% opacity. I attempted to make different shapes and lines in order to see how the brushes would behave under different conditions. After I analysed the results, I came to the conclusion that the Technical Pen and the Fine Tip Pen seemed to look closest to the line work in Ashe: Warmother. However, I could not quite make up my mind about which one seemed to work better between those two. In order to make that decision, I decided to try and redraw one of the faces in Ashe: Warmother and to then compare which one seemed to represent the line work from that comic better. After I drew the same face twice with the two separate pens, I came to the conclusion that the Fine Tip Pen seemed to handle that type of illustration smoother and was more true to the art style I was going for. Therefore, a large part of As It Lies would be lovingly crafted with the Fine Tip Pen in Procreate at 100% Opacity. Technical Specifications for the Fine Tip Pen, which will be used to create the illustrations of As It Lies. Once I knew what brush I was going to use, I need to start practicing the style and I figured that the best way to do that would be to try and recreate my latest portrait of Zeta in the newly established style. I began the process very similarly to the way I created the original concept piece, which was to start with the basic construction of the human body based on a pose by Liv Boeree. The difference this time around was that I was using further reference photos from Ashe: Warmother in order to determine how noses, eyes, lips, and so on are drawn in the desired style. The illustration was coming across as much more realistic than the original concept art I created, however, it was also rather sketchy and not as neat and clean. Upon analyzing my reference materials, I realized that comic book artists are not afraid to draw multiple lines and to show their audience that the work in a drawing. They do not always remove their mistakes and often include lines that fill large gaps of empty space. One issue I faced was with the construction of the nose as I kept making it look rather unnatural. However, after a few attempts and close looks at my reference materials I ended up getting it right with reasonably few lines. Following reasonable anatomical proportions and constantly looking at my references, I was able to construct my outline rather quickly. After I had crafted my outline for this concept piece, I thought it would be nice to experiment with a bit of shading, which is why I rather intuitively started filling in some of the spaces that needed it. As I began this process from the areas that would be darkest on the drawing, such as the shadows under her chin and around her neck, I progressively moved on to lighter areas. I was continuously trying to ensure that there is overall good contrast in the sketch and that no one area seems unnaturally dark or out of place. Once I was happy with the finished result, I saved that as a separate copy, so now I had the opportunity to compare which version seemed to work best. Overall, I would say that I prefer the cleaner version, which is showcased above, because it would allow for the opportunity to do some lovely coloring. If the game were black and white, the more high contrast version would be more appropriate as it would make the characters pop. However, as there will be color, the stark black shading might not allow for any other vibrancy at all. Overall, I really enjoyed learning how to draw in the style of modern comic books and I think I had reasonable success with my first attempts of replicating it. I did not find the process incredibly challenging and I was even surprised at how naturally it felt to draw in this way. I think that picking the appropriate reference images helped me quite a bit as I could see the way the artists used different types of line work in each panel. Specifically, I was very pleased to discover that the lines were not particularly clean and that there were occasional mistakes and roughed up sections in the illustration. After finishing the drawing I was also very happy to discover that the Fine Tip Pen I had selected earlier was appropriate. I have yet to explore how exactly I will be coloring this sketch, but nonetheless, this has been an excellent start thus far and I am excited to continue the exploration into the style. After my thorough investigation into different styles of graphic novels and how they have developed over the years, I thought it best to continue by exploring two-dimensional art styles in other forms of media. One of the first places I turned to was the traditional and old-school animation style of classic Disney films. As they essentially pioneered animation technology and were the creators of numerous successful and iconic characters, it seemed worthwhile to have a look at their distinct style. Disney films are very friendly, sweet, and welcoming, they do not feature any harsh outlines at all, while all of their protagonists have been designed with smooth and curvy outlines in mind. This contrasts the line art in quite a few comic books discussed in Week 1: The Start of Semester II as they focused on cross-hatching and realism, which is not present in the Disney style. Additionally, I am very fond of the use of basic geometric shapes and proportions in the Disney characters. They accentuate the most crucial elements of the character and help create a memorable silhouette. For example, oftentimes the heads of their characters tend to be rather large in comparison to the rest of the body, as the most emotion can be conveyed through the face and the eyes. This is what makes these characters so memorable, the fact that their most important features are exaggerated and make a focal point. However, even though the proportions of Disney characters are rather shifted and exaggerated, their characters are structurally sound. Similarly, in my own work, I will strive to play with anatomy, while still making sure that each character is believable and has a solid shape behind them. Character Sheets and Concept Work for Aurora, showcasing the soft and curvy lines Disney tends to prefer. In addition to the line work and the stylistic choice behind classical Disney heroes and heroines, I was also quite fond of the way they lay out their character sheets. They are essentially representative of sketchbook pages and show different poses and facial expressions of each character, all the while maintaining their proportions and some key angles. What’s more is that thanks to these layouts other illustrators would be able to learn how to create the characters accurately regardless of what they are doing in the specific scene. Overall, I think this is really good practice and I would love to do it with my own character sheets once I arrive at that stage. There is so much I could learn from the Disney method of character design and animation and I am very pleased that my research has taken me into this direction. Character Sheets from Disney showcasing the characters with a variety of different facial expressions. Moving away from the very distinct style of Disney, I went on to explore some other popular animated series. Specifically, I took a look at Castlevania and The Legend of Korra as they both seemed to share a very similar style. Their specific visual aesthetic focuses on very clean and very thin lines that only indicate where different objects and characters are positioned. The line work is even more discreet than that of Disney and its color changes depending on the scene. The characters in both of these shows are very anatomically correct and do not exaggerate proportions greatly. For the most part, they aim to be realistic and are much closer to the comic book art styles discussed in the previous post. The artists and animators of both of these shows have used vivid and vibrant colors while their shadows are more like blocks rather than gradients. I reckon this style would be quite difficult to replicate, but nonetheless it is good to at least explore the possibility. Whereas the last two examples I discussed were very much focused on realistic proportions and discreet outlines, there are a series of other animated series that take a more cartoonish approach. Both Marvel and DC’s Animated series are somewhat of a mix between the Disney style and the Castlevania/Legend of Korra style. Their shows combine the style of line work with Disney’s approach of exaggerated proportions and geometric shapes for many of their characters. This could be great for As It Lies, because the game very much fits into those themes and ideas, therefore, using a similar visual style might help with targeting the right audience. I am especially fond of the way Harley Quinn and Poison Ivy have been constructed in this style, as they have very distinct shapes and silhouettes, making them visually exciting. At this stage I am considering adopting this style, perhaps in combination with the comic book style, because of how visually distinct it is and because it has been used in thematically similar settings. The last distinct visual style that I explored is commonly used in concept art pieces and sketches. This style takes the cartoony and exaggerated approach even further, making characters and artifacts even more stylized and exaggerated. I think this might be taking the concept a step too far, simply because Zeta’s story is somewhat serious and can be requires focus from the player. The style showcased below is more adventurous and rather lighthearted. It would not require focus from players, but is rather best suited for telling a story. Nonetheless, I rather appreciate its visuals and how distinct and memorable it is. Although this style would not be appropriate for As It Lies, I appreciate it for its shapes, its quirkiness, and I can definitely see myself trying to create artwork of the sort on my own time. Over the course of this week I have conducted a thorough investigation into a variety of different art styles ranging from the many different types comic books over the years to Disney’s classical films. After reflecting upon everything I have seen and explored thus far, I believe a modern comic book style would be most appropriate for the game. The reasons for this decision are rooted in Zeta’s personality and world. From all of the different art styles, including Disney, Pop Art, Realism, and so on, a Comic Book Art Style is something she would engage most with. She would be interested in comic books, superheroes, and that whole aspect of geek culture. Therefore, Zeta’s story in 2D would best be told in a medium that she is fond of. What’s more is that comic books have long explored the idea of different superpowers and how one represents them in 2D, which is why they would be a fantastic reference for As It Lies. Additionally, from all of the different comic book styles discussed in Week 1: The Start of Semester II, I thought that going for a rather modern and generalized style would be best. After all, Zeta’s story is set in the future and as I cannot possibly account for potential future visual styles, it would be best to go with something rather modern and universal for the genre that will likely withstand the test of time. For example, comics from the Dark Age and other examples such as Casanova or Ashe: Warmother might be suitable references. Once I had submitted my Game Project Proposal, I had some time to reflect on everything I had written about this project thus far. I had the opportunity to take a step back from the detail and examine the game from a more general perspective. Additionally, I was also able to think about the time I had left until the due date and how I could best convey the essential experience of As It Lies within that time. Through this reflection and a series of discussions with James, I realised that perhaps I should I step away from 3D and instead focus on making this a 2D game that is dedicated to conveying the essential problem-solving experience. What’s most important about As It Lies is the set of mechanics, the exciting levels, the numerous solutions to each problem, and incorporating chance into them. There is nothing inherently superior about making this project 3D, other than the specific visual and low-poly style I was going for. Although this transition would introduce certain aesthetic limitations, As It Lies could function very similarly in a 2D environment. Therefore, as I am a more experienced illustrator and as I have only about three months to complete this project, I thought it would be most feasible for me to transition from 3D to 2D. This has simply been another step in the iterative process that will hopefully lead to a better and more complete game. In any case, I thought it would be something worth exploring. Having made this crucial design alteration, it was important to explore potential two-dimensional visual styles that would suit As It Lies. That is why I began exploring a variety of two-dimensional art forms, most notably different comic book and graphic novel styles as well as different styles of animated films and cartoons. Knowing Zeta would be an absolute geek, I thought she is very likely to be really into comics, so first I had an extensive look at the different illustration styles in that media. I am addressing the visual style based on what my protagonist is likely to enjoy and engage in. The first chapter in the history of comic books is known as The Golden Age of comics. Throughout the Golden Age of comic books, the differences between heroes and villains were very stark and it was rather obvious who the audience should be rooting for. Additionally, those stories would get political at times, with superheroes overpowering famous political figures. In terms of illustration, the art style features light and clean outlines with blocks of shadow in the appropriate places. Due to the printing technology of the time, colors were rather flat and would appear quite muted. Backgrounds in these stories were not very detailed, but rather focused on actions and characters. The panels of Golden Age comic books were in the form of a rather standard grid and did not focus break from the structure frequently. Perspective was also rather limited, as panels would most commonly feature one-point perspective as that was the easiest one to produce technically. Overall, Golden Age comic books were primarily concerned with conveying their story, rather than their illustrations. Examples of Golden Age comic book panels. The next chapter in comic book illustration history is known as The Silver Age of Comic Books. The illustration of these comics was more varied and sophisticated, as artists explored a more abstract style. The pages of Silver Age comics would feature surreal scenes, representing the character’s mental state in a more metaphorical manner. Colors became much more varied and had different gradients, while the outlines and shading differed in thickness and intensity. In terms of storytelling, the stories became a bit darker as the horror genre was just starting to take off in this medium. Heroes and villains were still very distinct from each other and characters were still rather archetypal, however, writers began to slowly break from that. Overall, illustration during The Silver Age of comics greatly improved, adding more variety and abstraction, while the types of stories they were telling evolved in terms of genre and some of the concepts explored. Examples of Silver Age comic book panels. After the developments to the medium in the Silver Age of comic books, the Bronze Age further built upon those concepts and presented heroes with new types of enemies. The Bronze Age was famous for its blunt realism and for the first time ever, heroes were faced with abstract problems such as alcoholism, drug use, overdose, and more. The intangible foes offered a new challenge for superheroes and did not lend an easy answer to the issues they were facing. The illustrative style reflected this paradigm shift and was also rather realistic and cross-hatched, oftentimes imitating sketches of the great Renaissance masters. Anatomy became increasingly more important and illustrators aimed to be quite blunt and accurate. The Bronze Age of comic books marked a very significant chapter in the evolution of the medium as both stories and illustrations became much more mature and were tackling everyday issues head on. Examples of Bronze Age comic book panels. Although new types of enemies were introduced in the Bronze Age of comic books, it was still very clear who the heroes of the story were and what was the moral thing to do in any situation. The Dark Age of comics completely turned that idea on its head and marked the most significant growth and evolution that the medium had experienced thus far. The lines between heroes and villains became blurred, with both displaying positive and negative qualities and ideologies. One of the most notable examples of Dark Age graphic novels is Alan Moore’s Watchmen. Illustrations became much more sophisticated with increasingly talented artists working in the industry and producing very realistic characters with both accurate and exaggerated proportions. What’s more is that due to advancements in mass printing technology, more striking and bright colors became possible, with higher contrast images that helped the story pop from the pages. Outlines were still maintained, but they varied in thickness and color depending on the needs of each panel. Typography became increasingly more important as it was oftentimes changed to reflect what characters would sound like while speaking. The Dark Age of comics marked a major step forward in their history, resulting in higher quality stories and artwork. Examples of Dark Age comic book panels. While there have been a series of distinct ages in the long history of comic books, modern comics and graphic novels do not fit into neat categories, but rather feature an array of stories and styles. They can contain multiple elements of Golden Age, Silver Age, and Dark Age comics, but can also branch off into their own thing that defies categorization all together. Both illustration and storytelling in modern day comic books are exceptionally varied and provide their audience with numerous different experiences. Casanova is an excellent example of a graphic novel that does not fit the traditional comic book illustration style, but rather uses its own distinct visual identity. They favor very thick outlines and caricatured characters with exaggerated proportions. Their color palettes are limited on each page, but work together in harmony and take advantage of known color theory principles to achieve their effects. Overall, Casanova’s visual style is incredibly distinct in line work, color, and characters, which translate excellently on paper. What I find particularly exciting about Casanova is the character proportions and exaggeration. Comic book panels and cover art for Casanova. It would be unjust to conduct an analysis of various two-dimensional art styles found in comic books and graphic novels without having a look at at least one notable example of manga. Akira is a highly successful cyberpunk graphic novel by Katsuhiro Otomo, which paved the way for other exceptional works such as Ghost in the Shell and Armitage III. What I find most fascinating about Akira’s visual style is the exceptionally well made perspective shots of the environment and of movement. Buildings and city landscapes in Akira are incredible realistic and accurate in terms of perspective, resulting in some awe-inspiring scenes. They give an excellent sense of space and convey the mood of the environment equally well. Additionally, the lines in Akira are relatively thick and provide exciting high-contrast images in the finished panels. What’s more is that as Akira’s story is set in a cyberpunk dystopia, there are a series of strict mechanical illustrations that convey the overall urban aesthetic of the city. Overall, Akira has a very precise and high-contrast art style that approaches storytelling in a different manner to the other ones discussed thus far. Perspective shots and panels from Akira. I found this extensive analysis of different visual and illustrative styles for graphic novels very intriguing and entertaining. It was a pleasure to explore how different artists have approached stories and mediums that I am passionate about and to try and adopt some of the principles they explore in my own work. For example, I have really enjoyed learning about how different outline thickness and smoothness can result in completely different effects on the page. Thus far, I am very excited to try some of these art styles for As It Lies and Zeta and to see how they would work. Additionally, I think a comic book art style would be rather appropriate for the game as this is something Zeta would be very fond of and she is likely to think of herself and of her solutions in those terms. What’s more is that it would be an amazing guide for the branding of the entire project. Nonetheless, it will now be time to explore a series of different art styles from cartoons and animations to determine whether a visual style from those mediums would be more appropriate for Zeta. After reading week was over, it was quite the relief to get back into my normal working schedule and to begin creating assets and prototypes during Week 8. At this stage, I had completed my idea generation and had come up with four fleshed out project proposals, one of which I was thinking of taking forward. Aside from mathematics, the common element between all four project proposals is that they would work best in a 3D environment. There is a potential problem with that as I have never really interacted with any 3D Modelling Software, aside from brief endeavours into texturing during Year 2. However, I am really passionate and enthusiastic about these projects, I want to bring them to life and to make them happen, which is why I have chosen to take on this challenge and learn how to create 3D Models. Week 8 was the perfect time to do this, because if I couldn’t handle the process at this stage I would have enough time to reconsider my options and potentially join a team. Nonetheless, I was determined to try my best and to create an asset by the end of the week. My program of choice was Blender as it is a professional-grade 3D Modelling Software, free of charge, and it was the program I used to texture last year, which meant I was conversational with its interface. 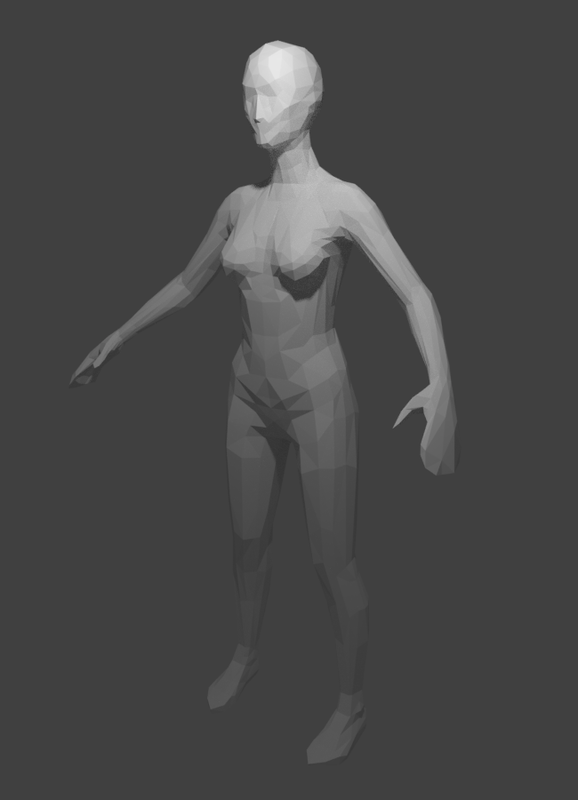 I started my journey into 3D Modelling with Blender by attempting to create a low-poly proportional female figure. Zeta, the protagonist of Project Proposal 4, will most likely be a healthy and athletic female, which is why I thought that trying to create a body for her as practice may be useful. Additionally, I have chosen to focus on a low-poly style as I am only beginning to learn 3D Modelling, and focusing on stylised and low-poly models would be a more feasible choice for my FMP. Overall, I would like to reiterate that my main goal here is to become familiar with Blender, to learn some of the basics of 3D Modelling, and to determine whether or not this was something I thought I could handle if I were to work by myself. The finished asset itself may not necessarily be used in the game, but if it does make it’s way to it, then all the better. Now, without further ado, let’s dive in. 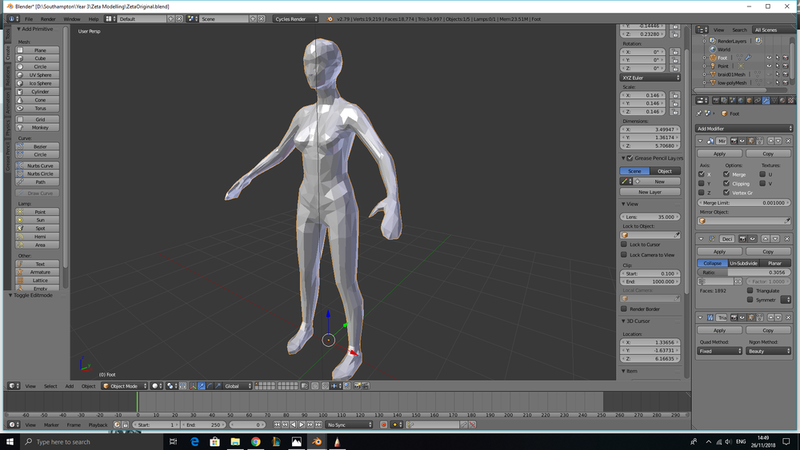 Before I started working in Blender, I thought I would explore other software for crafting Human 3D Models in order to create something to use as a reference for my own model. 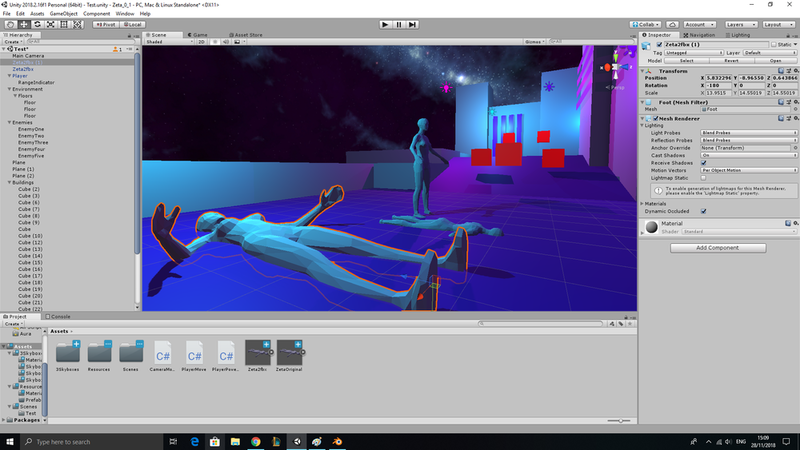 James S. recommended that I explore Make Human as it’s an open-source program designed specifically for making anatomically correct human models. Upon downloading and opening the program, I was surprised at how easy and user-friendly it was. Make Human generates a human 3D Model and allows users to change their gender, shape, form, and more, through the use of sliders. One can make humans taller, shorter, more muscular, chubbier, and all facial features may also be amended. Make Human even has a few in-built hair styles and clothing for the model, all textured. Below is an example of the default human model and the way the sliders work in this software. The whole process of crafting a model was really easy and straightforward, and all I did to create my character was to work with the default model and to adjust the sliders accordingly based on the features I wanted to change. I made the woman a bit slimmer, more muscular, and taller than average, as she is meant to be quite healthy and relatively athletic. I made her face slightly sharper and her nose a bit longer than the default model. After I was happy with my character in terms of facial features and overall body shaped, I took advantage of Make Human’s built in poses and facial expressions to bring more life to the model. The image below shows the finished character with Make Human’s textures. I went for a braided hairstyle as it seemed to work best with her face, and a pose to make the model seem more life-like. However, I would like to reiterate that these decisions are not particularly significant just yet, as I am merely using this model as a reference by which to create my own 3D Human Figure. Once I was happy with the model and it looked somewhat like what I envisioned for Zeta, I exported it as an FBX (as Unity tends to like that format), and was ready to begin working with it in Blender. Once I had my FBX from Make Human I imported it into Blender to use as a guide for my own model. 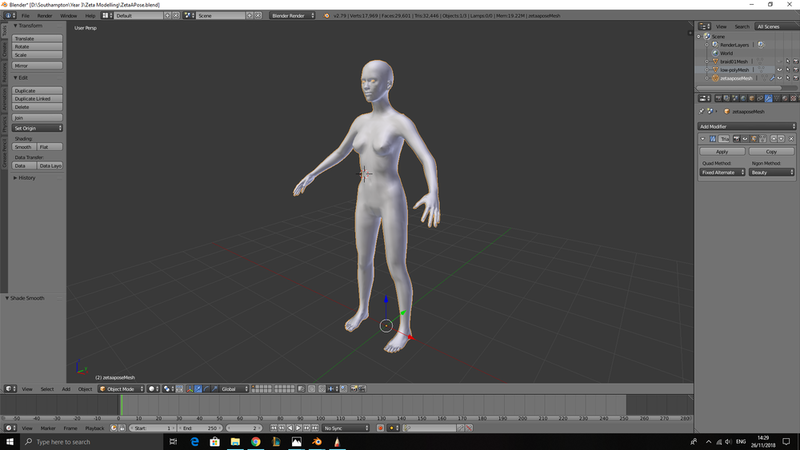 I chose to work with a model in the A-Pose, as my character will be rather unlikely to lift her hands up past that point, allowing me to model the shoulders with more detail. This is in contrast to the T-pose, where detail on the shoulders can get lost or distorted while doing animations. They key bit to remember here is that I am making a low-poly yet proportional human, which is why the highly detailed Make Human (MH) model serves as nothing more than a guide. I started off with a simple cube at the bottom of the left foot and I began shaping it and forming it along the outline of the MH model in order to get an abstracted version of the foot. One of the main tools I used was the Extrusion Tool, which works by selecting the face one would like to extrude and then pressing E. What’s lovely about Blender is that it automatically determines what type of extrusion would best fit the selected face, thus making the process a little easier and more user friendly. Another tool I used very commonly was the Loop Subdivide Tool (Ctrl+R), which creates a loop of edges and vertices around the selected object. This was hugely beneficial as it’s the way I was able to divide the cube I started with into a shape with more than eight vertices. Once you have those vertices, they can be dragged along each axis and changed into desired shapes, which is how I formed the foot. The original imported A-Pose Model from Make Human. As I was working with my cube, continuously using the Extrude Tool and the Loop Subdivide Tool, the model I had was slowly starting to look like a foot with an ankle. The MH Model was incredibly useful as it gave me insight into where to break the lines and form the appropriate curves of the human body. In that same fashion of using these tools, editing my vertices, shifting my edges, and occasionally grabbing entire faces of the model, I went up along the leg and was sure to include the key curves and breaks in it. I really enjoyed this process of abstraction because I had to continuously ask myself how much could I take away from the shape of the foot before it ceases to resemble a foot anymore. I was aiming for a relatively abstracted version, but still clearly distinguishable as a human foot and leg. Going along the leg and progressing towards the waist with the described techniques. Up until this point, I had been working only on one side of the leg, slowly creating half of the body. After a handy tip from Richard, I turned on the Mirror Modifier in Blender, in order to connect simultaneously create both the left and the ride side of the human. The model was mirrored along the X-Axis, with Clipping and Merge enabled, as I wanted both sides of the model to be connected and to result in one coherent shape. After enabling that modifier, I continued to go up along the body and to extrude it all the way up, working along its curvature. The most difficult and and time consuming areas thus far were by far the areas of her bottom and her breasts, as those we most shaped like an oval, which means they required significantly more subdivisions of the plane. Nonetheless, I was greatly enjoying the process thus far and was excited to complete the finished piece. Once I had crafted the body up until the neck, I branched off to the sides to complete the arms. Using the same methods of Extrusion and Subdivision, I proceeded to form the elbows, the muscles, and the armpits, which were rather challenging. I had the most difficulty viewing the area underneath the armpits as positioning the camera in a convenient way to edit the vertices often caused me to see the inside of the model, which was not very helpful. Nonetheless, I managed to work my way around that issue by positioning my view towards the side of the model rather than directly beneath. Another very challenging part of this area for me was the hand. I knew that I wasn’t going to create all five fingers as that seemed unnecessary for a low-poly model, so I focused on the thumb and combined all four fingers to essentially create a mitten. Nonetheless, I found it really difficult to account for the curvature of the palm, and I required a series of subdivisions to get that done correctly. After it was all complete, I was rather pleased with the result as it did resemble an abstracted human hand. However, I am eternally grateful I do not need to repeat the process on the other side. 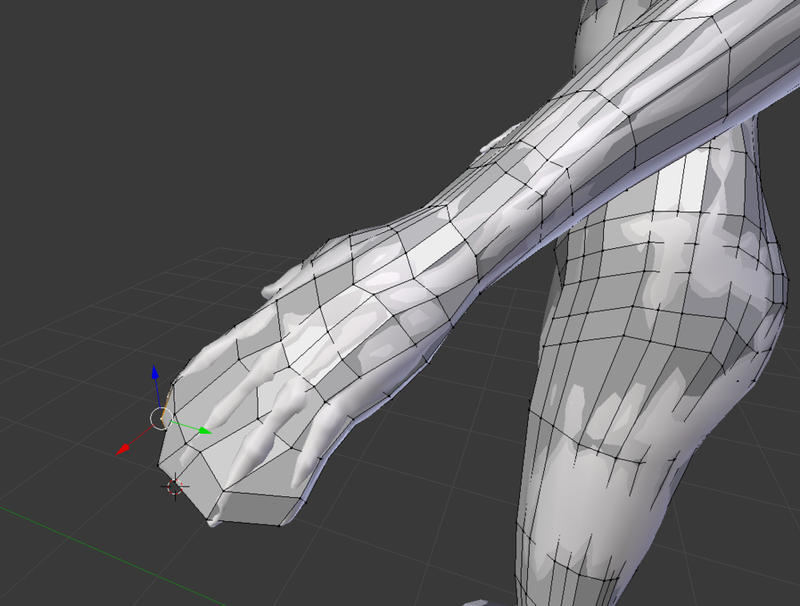 Extrusion of of the area around the armpit, which will eventually form the arm. The hand and arm near completion, by far one of the trickiest areas to get right. After I had created the entire body, including the arms, it was time to proceed to the head, the section I found the most challenging. 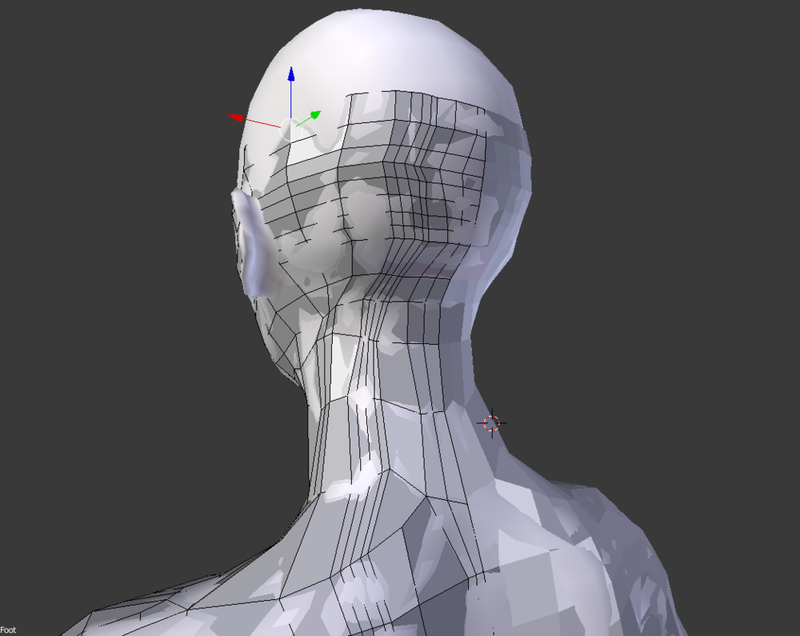 In the same fashion as before, I began by extruding a small section from the neck and slowly matching all of my vertices to points in the face where they touched the MH Model. The difficulty with the head came from the fact that it was the most ovular part of the entire body and thus required more vertices to get it done accurately. Additionally, as this is a low-poly model I did not model the face based on the MH Model, but rather made my own version, which only had very basic indents to indicate the eyes and the mouth, and a simple bump for the nose. I did go over and edit the face a couple of times because I kept making mistakes with stray vertices and geometry, but nonetheless, I got there in the end. Below is an example of how I would fix any mistakes I found within the face and the entire body. Whenever I notices that something was off with the model in Solid View, I became suspicious of what has transpired. To investigate the issue, I would enter the Wire Frame View of the model, which only displays the mesh of the model. Once a face is selected as shown below, if there are any stay vertices or edges, they become really easy to spot. The way I fixed problems of the sort was a bit clumsy, but nonetheless, efficient. I would merely delete or dissolve the problematic vertex and then merely fill in any holes the process may have caused in the model. I was rather lucky, because I did not have an abundance of such instances at all, so there was no need for excessive deletion and rebuilding. Once the head was all done and I had fixed all of my mistakes along the way, I went on to clean up the model from any stray or unnecessary edges and vertices, which significantly decreased my Vert Count and my Tri Count, making the model much more optimal. Once I was happy with the model overall, I took a look at it from afar and tried to experiment with some of the Modifiers in Blender. Specifically, I wanted to make the model look even more low-poly than it already was. That is why I explored the Decimate Modifier, which essentially decreases the number of Polygons in the model. I found the process rather exciting because by editing the Collapse Ratio, which is a slider, I could change the model from its current form to a single triangle. The question I was asking myself while using this Modifier was how much information can I take away before the object is virtually indistinguishable. I found that for now, the ideal ratio was somewhere around 0.3050, however, I could decimate it even further if needs be. Another Modifier I explored was the Triangulate Modifier, which essentially divides each face of the model from Quads to Tris. I personally much prefer Tris, because mathematically, any three points can fall into the same plane, which is quite nice to model and work with. Quads on the other hand, do not always have all of their vertices in the same place, which can lead to some difficult to spot and undesirable geometry. Once all of the Modifiers were applied, the model was complete. To my surprise, I’ve really enjoyed creating this model. The process was not overly complex and it was an excellent exercise in familiarising myself with the Blender, some of its shortcuts and its interface. There were plenty of challenges along the way, most notably with the more ovular shapes of the human body, but they were all manageable and I managed to work through them without too much trouble. One very frustrating setback was that while I was crafting the head, my computer completely crashed causing me to lose some of my progress. However, I took it as a learning moment, and acknowledges that I should be saving rather frequently as there is a risk of things like that happening. Through this model, I have now familiarised myself with Modelling via Extrusion, working with vertices, edges, faces, I’ve explored a few modifiers, and I have clearly pushed the technical limitations of my personal computer. I’ve explored how to fix certain problems and how to optimise my model by dissolving unnecessary geometry. To top it all off, I am rather happy with the final result, which is attached below. This is my very first 3D Model and it seems to look rather decent, better than I expected in any case. The model seems fairly well optimised with 934 Verts, 1,920 faces, and 1,920 Tris, although there does not seem to be a solid number one should aim for with these stats. Creating this figure took me about three days during which I was also working on other prototype pieces. This should hopefully mean that if I stick with a relatively low-poly style, I should be able to feasibly create a 3D game by the end of the year, which is incredibly exciting. This exploration has been incredibly motivating and I am looking forward to getting back into it.